Welcome to Issue #2 of Hawaii Home & Garden magazine! As I write this, we're mid-way through July, which means one half of summer in Hawaii has already come and gone. Wow. That was too fast. Summer in Hawaii is a real joy. Well worth the cost of admission. July 2015 also means Hawaii Home & Garden Network has been up and running for one year now. We've come a long way. The first client who jumped on board with us, Hawaii Kitchen & Bath, their blogs keep popping up all over the place. Literally. New York, Florida, Washington and they have a fan in Wichita, Kansas. Thankfully though, most of their readers are in Hawaii. Their most popular blog over the last couple of months (but not overall) has been about TechTop's wireless charging transmitter fitted into an LG Hausys solid surface or LG Viatera quartz countertop. Subtitles: "No wires." Kitchen remodeling takes a step up into a wireless world in "Wireless charging through your solid surface countertop." “Wireless charging through your solid surface countertop,” featuring Hawaii Kitchen & Bath. We've been lucky at HHGN. Having one second gen home remodeling client was great. Having two, and I'm looking for where the maneki-neko (fortune cat) is hiding. 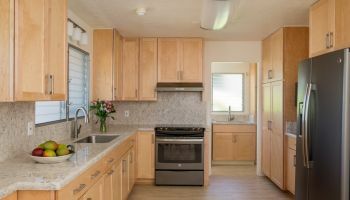 Homeowners Design Center has been helping Hawaii homeowners with their kitchen remodeling dreams since 1969. They continue to turn out many wonderful projects year after year. And this year, the blog that people have been clicking through like mad on has been "A kitchen remodel mixes modern updates of stylishly good taste." 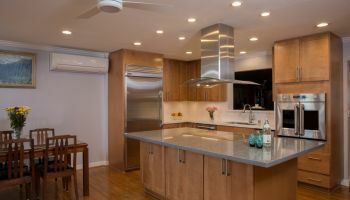 “A kitchen remodel mixes modern updates of stylishly good taste,” featuring Homeowners Design Center. Our bathroom remodeling feature comes from a business owner who seems to have a bond with the letter "S". Snowboarding and seamless solid surface seem to have been his calling, and his name also happens to be "Scott". INSOLID's feature story for this issue has also drawn a lot of interest on the Web. It's a great home remodeling project with a great story, so we're not surprised. It exemplifies who they are and what they do in "Custom, solid surface, bathroom remodel exudes spa appeal for $15.5K"
“Custom, solid surface, bathroom remodel exudes spa appeal for $15.5K,” featuring INSOLID. We feel very fortunate to display the expertise of these experienced and respected home remodeling professionals showcased on our site. An entrepreneur once told me, "If they do what they say they will do, they do it for a fair price and they're easy to work with, it's hard to go wrong by choosing them." To find more information on these home remodeling professionals to see how they can help you with your home, kitchen or bathroom remodeling project, just click on their company name. Enjoy the rest of your summer. It looks to be a great one.